BCcampus is pleased to announce that the BC Open Textbook Accessibility Toolkit has won an award for Open Education Excellence, in the category of Creative Innovation. 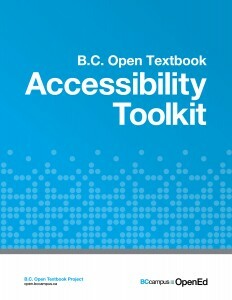 The Accessibility Toolkit is a collaboration between BCcampus, CAPER-BC, and Sue Doner of Camosun College. The goal of the Accessibility Toolkit is to provide the resources needed so that each content creator, instructional designer, educational technologist, librarian, administrator, teaching assistant, etc. has the opportunity to create a truly open and accessible textbook. An open textbook that is free and accessible for all students. The Open Education Consortium is a global network of educational institutions, individuals and organizations that support an approach to education based on openness, including collaboration, innovation and collective development and use of open educational materials. The Open Education Consortium is a non-profit, social benefit organization registered in the United States and operating worldwide.